Even considering only two cycles of data rather than three, we still don’t really have enough voters who flipped from Democrat to Republican from 2016 to 2018 (just 36, all told), so we’re going to exclude them for now. This post focuses on certain measures of race and shows that voters who swung from the Republicans to the Democrats from 2016 to 2018 are much closer to the GOP on race issues than to the Democrats. This is important for Democrats to know because the Republicans will have an outspoken racist at the top of the ticket in 2020. We’ve proposed some policy-based ways forward here, but whatever the way forward is, Democrats must be prepared for a voting middle that is significantly worse on race than we might hope. Which of the following is closer to your view regarding the Confederate flag? Overall, voters were narrowly split on this: About 44 percent of respondents said it is mostly a symbol of slavery and white supremacy, 48 percent said it was a symbol of Southern heritage, and about 8 percent said they were unsure (For context, 8 percent is roughly normal for an item of this kind). But among voters who switched from Republicans to Democrats in 2018, their views were much closer to traditional Republicans: 72 percent of Rep ‘16 to Dem ‘18 voters felt it was a symbol of Southern heritage, which is statistically equivalent to the 62 percent of those who didn’t vote in 2016 or voted for a third party in 2016 to voted for a Republican in 2018, and slightly below the 90 percent of loyal Republicans who said it was a symbol of Southern heritage. 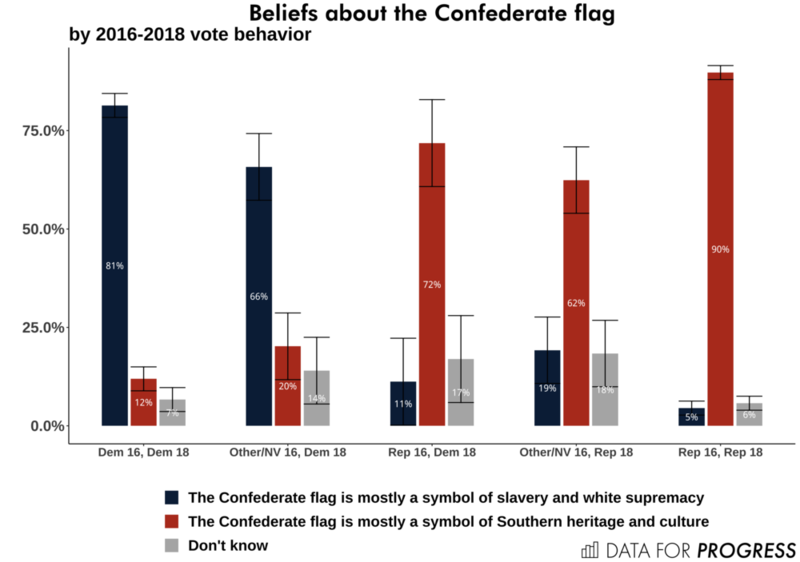 Democrats were the opposite: 81 percent of loyal Democrats recognize the Confederate flag as a symbol of slavery and white supremacy, as do 66 percent of those who didn’t vote in 2016 or voted for a third party in 2016 and voted Democrat in 2018. Those quantities are well outside the confidence intervals needed to assert that Democrats and non-voters or third party voters turned Democrats are different from Rep-Dem voters on the question of the Confederate flag. One reason for this speaks for itself: Rep-Dem voters from 2016-2018 are significantly more white than loyal Dem and Other/NV-Dem voters, but also slightly less white than Other/NV-Rep voters and Rep-Rep voters. Fully 83 percent of Rep-Dem voters are white, compared to 67 percent of loyal Democrats and 90 percent of loyal Republicans. Rep-Dem voters are much older than loyal Democrats and Other/NV-Democrats as well. The average Rep-Dem voter from 2016-2018 was about 58 years old, roughly the same age as the average loyal Republican. The average loyal Democrat was fully five years younger. Those who didn’t vote in 2016 or voted for a third party but then voted for the Democrats were younger still, as were non-voters/third party voters who voted Republican in 2018. In addition to their views on the role of the Confederate flag in American history, Rep-Dem voters were closer to Republicans on measures of racial animus than they were to Democrats. We have explained our scale, based on current social science research on the subject, elsewhere, with details below. On that scale, Rep 16-Dem 18 voters scored much worse than loyal Democrats and other/non-voters turned Democrats. Rep 16-Dem 18 voters averaged about 35 percent of the full racial animus scale, compared to just 12 percent for loyal Democrats and 48 percent for loyal Republicans. While still not as bad on race as Republican voters, those swing voters are plainly closer to Republicans on race issues. There is no doubt that Trump’s re-election campaign is going to rely largely on racism. Absent any policy accomplishments except for a widely reviled tax cut and the least popular Supreme Court nominees in modern history, Trump’s general strategy will inevitably involve the same appeals to white supremacy as his campaign deployed in 2016 and 2018. Democrats should be prepared for what this means for their strategy going forward. We will have subsequent posts on this very subject in the coming weeks. Between October 27 and November 7, 2018, YouGov Blue surveyed a nationally representative sample of 3,215 respondents. The overall survey margin of error was +/- 2 percent. The sample was weighted to the 2018 electorate. In our survey, respondents were asked to “indicate the extent to which [they] agree with each of the following statements.” The items, presented below, were asked in random order.